As 2018 begins, many of us are thinking about our New Year’s resolutions. While the most common resolution is to lose weight, if you surveyed a group of Christians you might find a different #1. Many believers resolve to read their Bible more in the new year. This is a worthy resolution. The Bible is God’s revelation of Himself to us. In it, the Creator of the universe tells us what He’s like, what He’s doing, and how we can know Him. In short, through the Bible, God speaks to us. Most of us have good intentions for reading the Bible, but our desire usually gets derailed for two reasons: 1) lack of planning and/or 2) discouragement. It becomes pretty easy to skip your reading when you’re in a rush and not really sure what to read next. This is where a plan helps. But sometimes our plan can be the problem. When we’re in a rush and our plan says we have to read five chapters, it’s easy to get discouraged by the task and skip it. So what are we to do? Pick a plan that fits your personality and lifestyle. Are you prone to miss days and get frustrated? Pick a plan with room to miss. Are you motivated by ambitious goals? Choose one that will push you. There’s no right or wrong plan. Below I’ve listed several Bible reading plans. Take some time to check them out and pick the one that’s best for you. Then dive in and allow yourself to be changed by the very words of God! This plan was designed to battle the guilt that builds when you miss a day in other plans. On each day of the week, you read a genre of scripture (i.e. epistles on Saturdays, poetry on Sundays). Because readings aren’t dated, your plan isn’t derailed if you miss a day. You just pick up where you left off last week. Plus, you get a sampling of the whole Bible every week which helps keep it fresh. Plan courtesy Ransom Fellowship. This is what I do most years. Basically, you pick a book of the Bible and read it (in one sitting if you can) over and over again. This allows you to take in the book as a whole, which is how they were originally meant to be read. It also gives the scripture an opportunity to get down deep in your bones. The plan also has the added benefit of not being thrown off track if you miss a day. Probably the most widely used plan, this was created by Scottish minister Robert M’Cheyne in the mid-1800’s. Even though it’s old, it’s usefulness is proven by it’s staying power. It is designed for you to read the Old Testament once and the New Testament and Psalms twice, with both Old and New Testament readings each day. The plan requires you to read about four chapters per day. If that seems like too much, perhaps you should try this adaptation that stretches it out over two years. 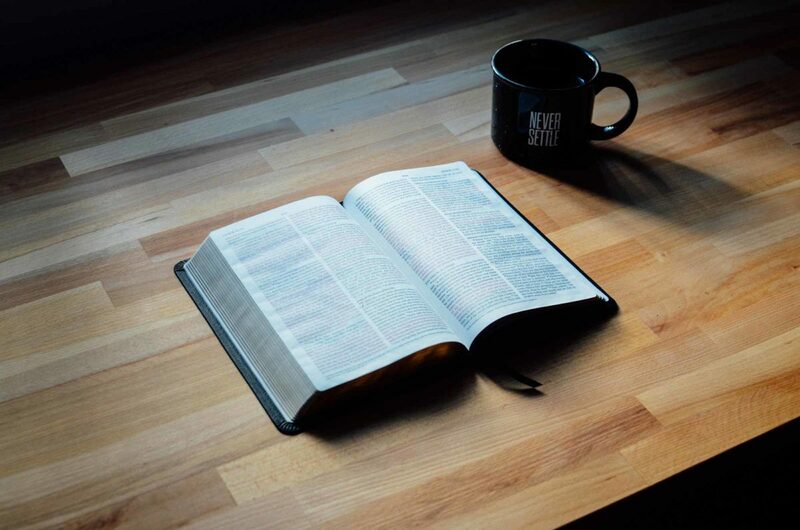 The 5x5x5 name is short for “5 minutes, 5 days a week, 5 ways to dig deeper.” The plan is designed for people who are new to reading the Bible and has readings only from the New Testament. It’s short (5 minutes), has days off, and is really helpful in teaching you how to apply the Bible to your life. Courtesy Discipleship Journal. Designed to be completed in one year, this plan will take you through the Bible in the order the events happened. You may not be aware, but the order that the books of the Bible are in don’t always line up with how they happened in history. This plan lets you see more clearly how the grand story of scripture unfolds. I’m going to try this one in 2018. I really like how it’s set up. There are only 5 readings a week, so you have space to catch up if you miss or dive deeper on your off days. Also, it covers the entire Bible in one year but unlike the M’Cheyne plan, you only read the NT and Psalms once. Finally, it is “semi-chronological” in that the OT is laid out in order, but you don’t have to wait until the end of the year to come to NT readings. Many Bible apps for your phone include reading plans. The YouVersion (Android | iPhone) app and ESV Bible (Android | iPhone) app both have really great options for you to choose from. This means you don’t have to print anything out and can do your reading whenever and wherever you are. We read the Bible because we love God and are thankful for what He’s done for us in Christ. We want to know Him, understand Him, and hear from Him because we’re in a relationship with Him. Just like any other healthy relationship, we can rest in the knowledge that God loves us and we don’t have to impress Him. This is important to remember as the year wears on. You’ll miss days. You may even miss a whole week. It won’t change God’s love for you. You didn’t earn it in the first place, so you shouldn’t feel any pressure to keep it. Reading your Bible is a response to God’s love, not a strategy to earn it.